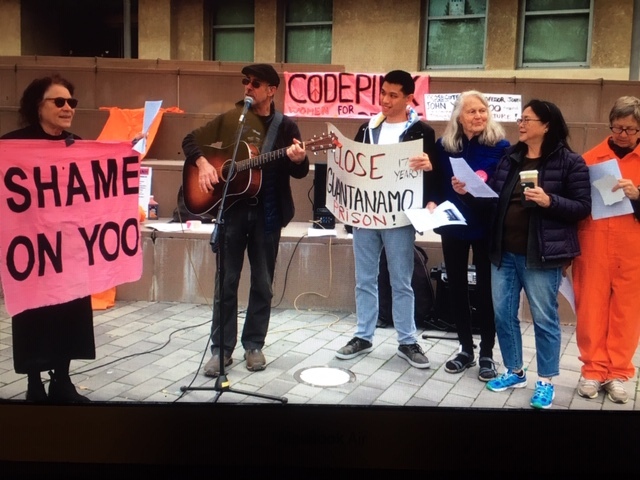 CODEPINK Women for Peace, Defending Rights & Defense, and the Berkeley Peace and Justice Commission gathered outside Boalt Hall on the 17th anniversary of the opening of Guantanamo Bay prison to protest the continued indefinite detention of 40 men at the prison, including 5 who have been cleared for release. They also demanded accountability for UC Berkeley Law School professor John Yoo. While at the White House Office of Legal Counsel under President Bush, John Yoo authored the infamous “torture memos” justifying the use of torture. The activists charge that Yoo is guilty of conspiracy to torture and a war criminal who should be prosecuted. They delivered a letter to Dean of the Law School, Edwin Chemerinsky requesting a meeting. Members of human rights, peace, and justice groups, potentially including alumni of Boalt Hall, the Berkeley Peace and Justice Commission, Berkeley No More Guantanamos, Defending Rights and DIssent, Meiklejohn Civil Liberties Institute, the Ecumenical Peace Institute, Codepink Women for Peace, the Unitarian Universalist Social Justice Committee, Veterans for Peace, and others, are holding a press conference and rally at the Law School this Friday, January 11, from 12:30-1:30 pm, to mark the 17th Anniversary of Guantanamo Prison, and to once again call for the prosecution of John Yoo for his complicity in torture and other human rights abuses. We will be gathering in front of the UC Berkeley Law School and have invited the local media to cover the event. In addition, we would like to have an opportunity to meet with you at your earliest convenience, and to deliver materials to you to provide information on past initiatives in regard to Professor John Yoo’s role in the Bush Administration’s illegal policies of torture. The information we provide will include Berkeley City Council Resolutions, community and UC alumni petitions, and UC Berkeley Law School student and faculty petitions, all of which call for investigations and action to be taken concerning Yoo’s fitness to teach at UC Berkeley Law School. Our goal in meeting with you is to simply present the information and to ask for your response as Dean of the Law School. We’re aware that you have stated in the past that you believe John Yoo could be prosecuted for his role in U.S. torture policy. Thank you for your consideration of this request. Please respond at your earliest opportunity to our meeting request. The Federal Torture Act specifically includes conspiracy, stating that “a person who conspires to commit an offense under this section shall be subject to the same penalties…as the penalties prescribed for the offense.” That means Yoo could be sentenced to up to twenty years in prison if found guilty.